Young Gifted and Black: 230 Nigerian girls Kidnapped, still MISSING! How Can Black Americans Help in the U.S.? 230 Nigerian girls Kidnapped, still MISSING! How Can Black Americans Help in the U.S.? First..you can sign the Petition available at Change.Org..so far it has close to 73,000 signatures! Here is a synopsis of what is going on in Nigeria., we reported this story a week ago..Please Share! Every girl/woman is important no matter their location. Lets show our African Sisters we stand in Solidarity with them! In recent years, countries which have experienced insurgencies, wars, conflicts and internal turbulence, record that the most devastating impacts of these crises are experienced by children, girls and young women who are left vulnerable to extensive attacks and dehumanizing conditions. The abducted young girls are being affected by a conflict they did not create, and their voices need to be heard. It can only be imagined what they have undergone in these past weeks or what they are bring subjected to at hand. 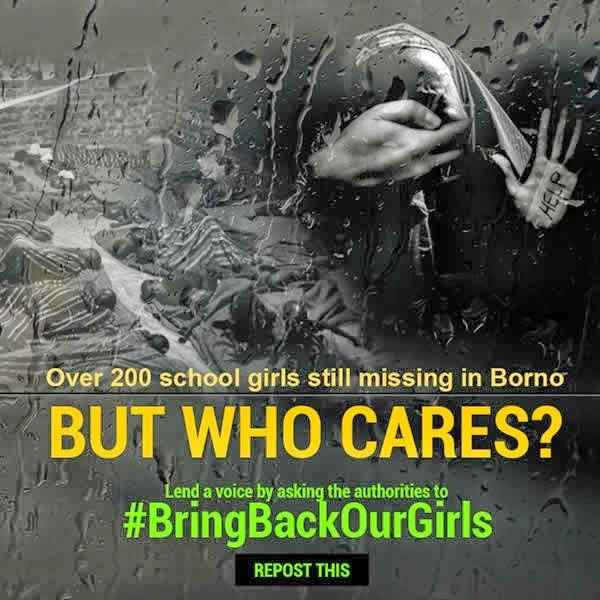 By signing this petition we declare our solidarity with the kidnapped girls and call upon the world not to forget them, support all efforts to ensure their safe return, and ask President Goodluck Jonathan and the Nigerian Government to ensure all schools are safe places to learn, protected from attack.